Billy Ballpoint and Mr. Alien come to a realization about #Humanity. Yep, people are pretty horrible to each other. It's particularly sad since it's so rarely necessary. Enjoying new daily BALLPOINT ADVENTURES comics this month? Support me on Patreon for as little as $1/month and I may be able to do daily new strips EVERY month! Click here to see the full=size comic strip! This just seems wrong... Billy making the case in humanity's favor? I hear this argument a LOT from people--that humans are "generally good" but really, where's the evidence? Like what you see? Check out INKSTREME.BALLPOINTADVENTURES.COM for more ink-based antics! Not sure where I'm going with this--Inktober's got me writing gags quickly. This is the same alien that.. The #TransPacificPartnership (#TPP) is back in the news and Billy & Barbie are PSYCHED! I was wondering what ever happened to that notorious "little" trade deal! Click here for the full-size comic strip! It's actually like our priorities are actually, completely upside-down, actually! Billy calls #ThePope on his #MixedMessages! #Inktober2015 #Inktober! Check it out! I'm doing Inktober with Ballpoint Adventures!! If you like what you see, please check out INKSTREME.BALLPOINTADVENTURES.COM for more crazy ink-related antics! Click here to see the full size shameless fanboyism--I MEAN--comic strip. Billy is perfectly comfortable admitting that he was in the theater opening night for STAR WARS EPISODE 1 THE PHANTOM MENACE. Does a Presidential Candidate's HAIR Make a Difference? Billy says YES! Billy employs NATO navigation tactics in this week's #BallpointAdventures #TBT strip from May 10, 1999! Click here to see the full-size webcomic! There is a bit of a story behind this one that ironically makes this strip seem pretty dated (but really, it's not). I mean, nowadays, who cares if a bunch of innocent people got killed because NATO had bad intel? This sort of thing happens all the time, these days. But please read on to understand what this comic is really about. 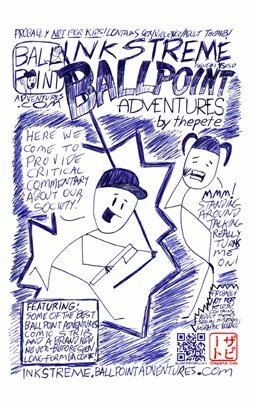 Bombo Ballpoint Outlines his Presidential Campaign Platform on #BallpointAdventures.com! Click here to see the full-size webcomic. Would you vote for a clown for president? You may get your chance! BALLPOINT ADVENTURES for 4/26/99: Sometimes Billy Thinks Like a #Republican. Sometimes Billy thinks like a Republican. What other party likes to ruin it for everybody? BALLPOINT ADVENTURES for 8/3/15: Elephants, Asses, and Clowns--Sounds Like a Circus to Billy! Click here to see the full size web comic.